Photosport ROUND THE WORLD: A concept picture of Team New Zealand's entry in the Volvo World Ocean Race. Team New Zealand boss says he loves racing around the world but has ruled himself out being on the crew for the Volvo Ocean Race. With the next America's Cup not expected to be staged until 2013 or 2014, Team NZ today confirmed that it would compete in the 2011-12 Volvo event, with Spanish footwear manufacturer Camper as the primary sponsor. 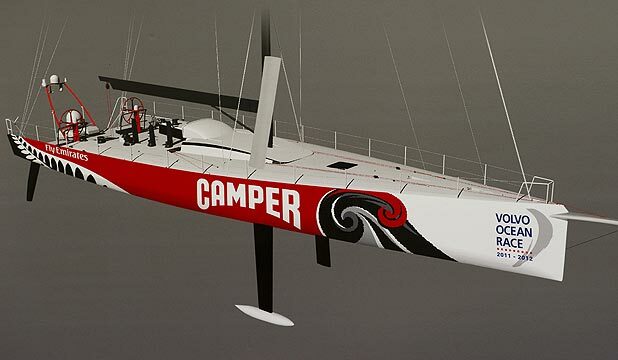 The syndicate's boat, which Auckland firm Cooksons would begin building in August, will be named Camper and will fly the flags of the Royal New Zealand Yacht Squadron and the Real Club Nautico de Palma. Dalton competed in the Volvo's precursor, the Whitbread Round-the-World Race, six times and was twice part of winning teams - in 1981-82 on Flyer and in 1993-94 as skipper of Endeavour. But he won't be in Camper's 11-strong crew of 10 sailors, three of whom have to be under 30, and a cameraman during any of the legs. "I would love to do some of the race, I would love to do the whole race," he said. "But I can't because, one, there's money to raise, and it's not fair on the guys to say, 'That looks like a fairly cool leg, I'll do that one'." However, Dalton intended to spend some time sailing on the yacht, describing Volvo Open 70s as "cool boats". He also said Team NZ was looking on the "open market" for a skipper.